This is the sixth week of GAGs and I've many more in store for you. Because I am presently in a different time zone my compilation is coming to you a bit later this week. As previously stated the selections here are subject to my personal biases ( I favour posts that contain original material) and I make no apology for that. 1. And I'm a proud one too, Vance. 4. Stuck for a Christmas present idea? Here's an idea from Canada for those with Scots ancestry. 5. I'm a sucker for stories that mention chooks. 7. Pleased I was able to help Alex. 8. Information for bods in NSW right from the horse's mouth. 9. Definitely demonstrating my bias (as an #AFFHO Congress Official Blogger) with this selection. 10. I'm a cruiseaholic Sharon. It's a great way to travel. 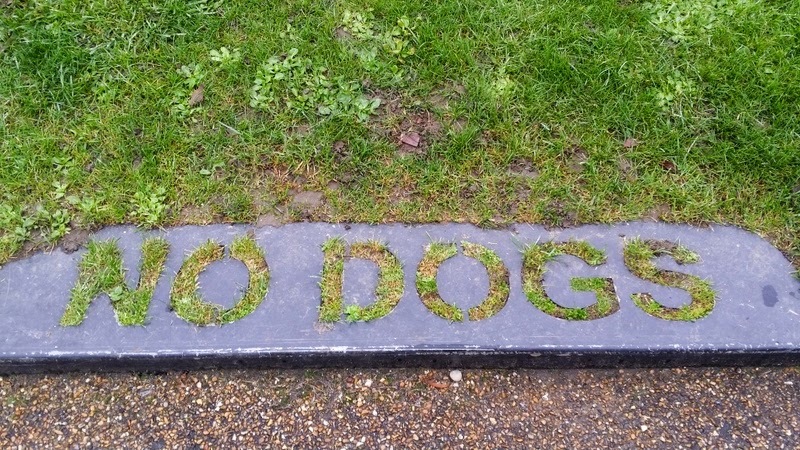 Wandering along a street in Islington we saw this sign. 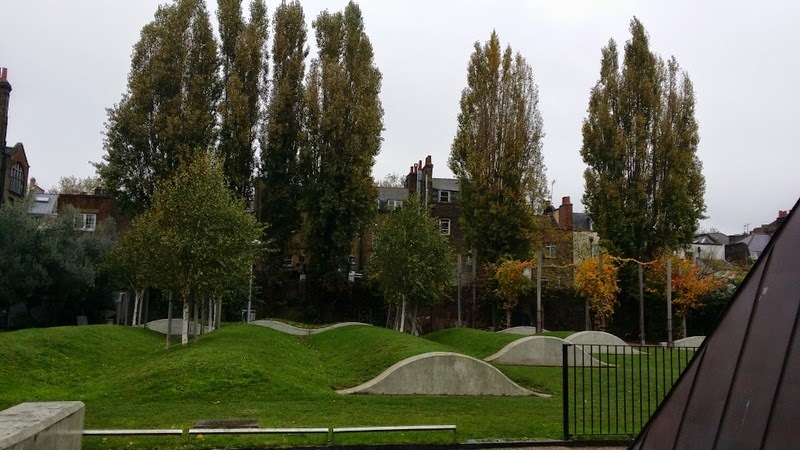 It is part of "The Streets they left Behind" project which is currently being undertaken by Islington Heritage Service. 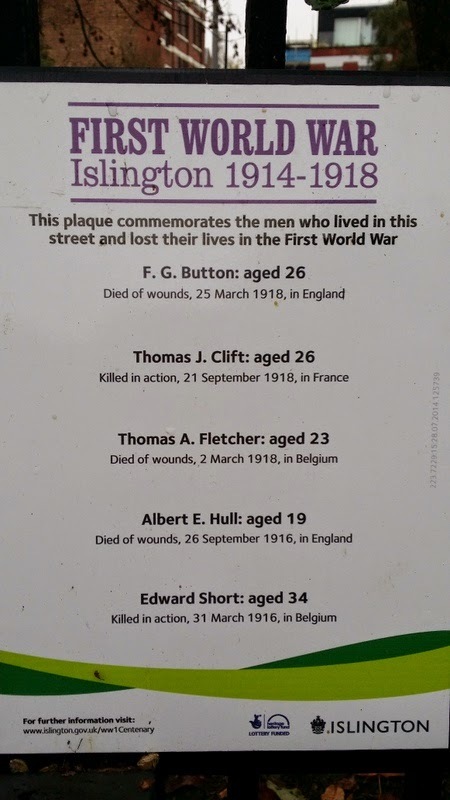 This sees plaques being installed on Islington streets to remember all those who died from each respective street. 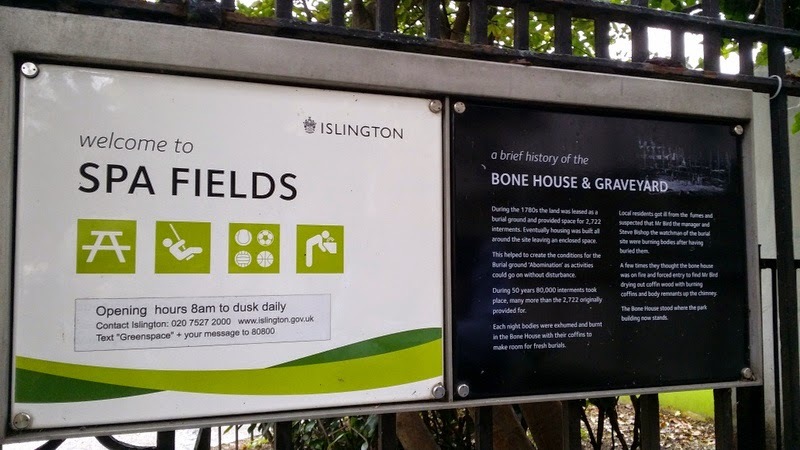 Opposite The London Metropolitan Archives is a delightful and attractive park "Spa Fields." Here are some snaps I took on a recent visit. 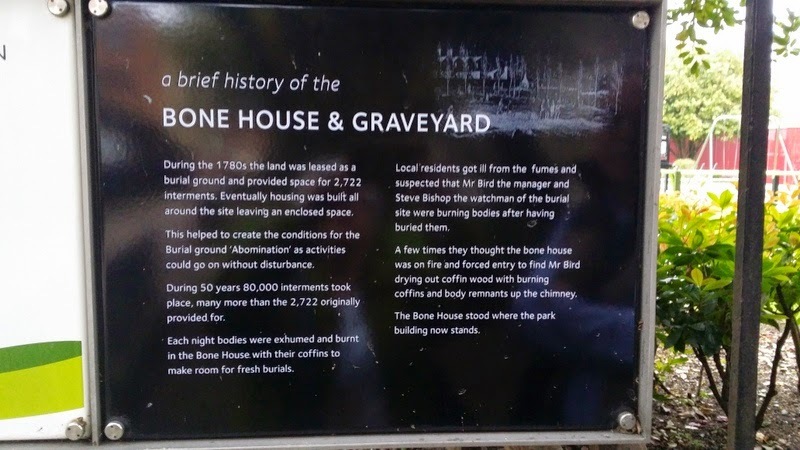 It seems that Spa Fields wasn't always a park for the living. I'm pleased that Mr GeniAus suggested we take that route. Together with my fellow 2015 Congress Official Bloggers Pauleen Cass and Shauna Hicks I will be sharing interviews with Congress presenters, attendees and organisers on this blog from time to time. These may be in the form of written responses to questions we pose or they may be videos we record using Google Hangouts on Air. I thank Congress presenter and official blogger Pauleen Cass for being first cab off the rank, Pauleen and I hooked up earlier this week for a Google Hangout on Air where we discussed family history and Congress matters. You can watch Pauleen's interview below in this post or via this link at my Youtube channel. As I am travelling to Salt Lake City for Rootstech in 2015 I was hoping that I would receive an invitation to be an Official Blogger once more for quite a few reasons some of which are selfish. Well tonight my spirits were lifted when I saw an email from Paul Nauta, Rootstech Public Affairs, with the Subject line"You're Invited to be a RootsTech 2015 Official Ambassador!" The Official Bloggers' role has morphed to Ambassador (I guess) to recognise that broad range of social media platforms that are now being embraced by family historians. So for 2015 I will not only be blogging about Rootstech I will be using Facebook, Google+, Google Hangouts Twitter and Youtube to spread the word. I already have an idea for the competition I will be running for someone to win a free Rootstech registration If you have already registered then if you are the lucky winner you will get a refund. Please watch this blog for details. 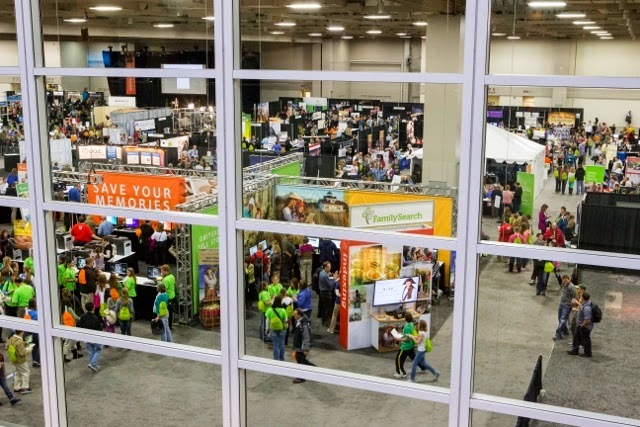 Will I see you at Rootstech? This fifth week of GAGs has netted me a bumper list of posts so I have had trouble making my selections. I am pleased to hear that my list is directing my readers to new blogs. I thank my genimate in San Diego, Randy Seaver, for adding my links to his weekly "Best of the Geneablogs", I am sure that your readers will enjoy some of the offerings I highlight from genies downunder. 1. No doubt the title of this post from Chris Paton which mentions Aussie research drew many people to his blog this week. BTW this is one foreign blog all Aussies should read. 3. As with Love and Marriage you can't have one without the other. Read Kate Cole's guest post on Pauleen's blog to see what I'm talking about. I think Pauleeen may be speaking on that topic at Congress 2015. 4. I love Eliot's quirky sense of humour. Will you be taking up his challenge? 6. Marion's thoughts on Bonnets, burqas and bikinis. 8. This lady is from Victoria, I don't know her name but I enjoy her posts. I love books so the title of this post and the second image grabbed my attention. 10. A reader's comment on Alex's post said "mesmerising post" and it is. Unfortunately as my internet connection was patchy I had to edit out the end of the Hangout where I thanked Martyn Killion from SAG for being a great webinar host and moderator. I also forgot to mention that the Australian War Memorial is seeking volunteers to transcribe WW1 diaries. If you are able to assist you can email info@awm.gov.au. 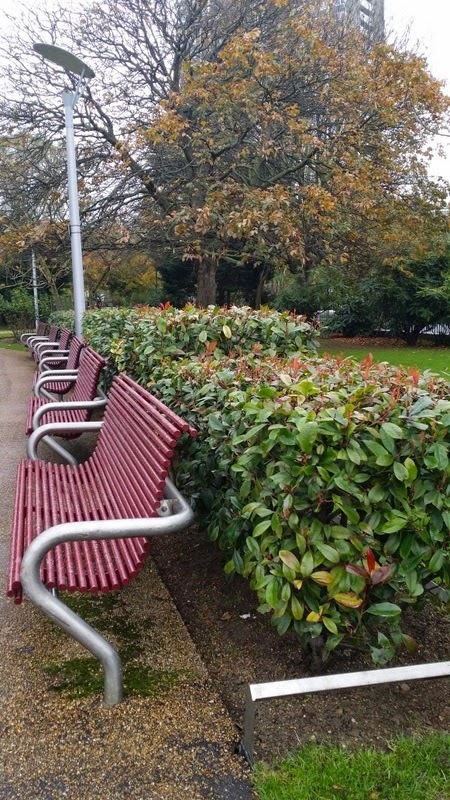 I often drag the chain so when Judy Webster set up the Genealogists for Families Group on Kiva on 27th September 2014 it took me a couple of weeks to sign up. I was reminded of my impending Kivaversary in a post from my blogging mate Pauleen who was quicker off the mark to join the group. Today it is three years since I joined the team. I prefer to lend than to give. As I can reinvest my funds when they are repaid I feel that my charity dollars work very hard and return great results for the borrowers and for me as a lender. I get a real buzz from helping other people and families. I enjoy the camaraderie of my fellow team members. I note that the number of new members joining the Genealogists for Families Group on Kiva has slowed to a trickle this year, it would be great if our ranks could grow so that we could do even more good. For the price of just five cups of coffee you could make a loan that may change a life. Here is your invitation to join our team. Less then 30 years ago letters and articles like the one I share below were a major means of seeking assistance to solve genealogical mysteries. Although people today still put notices in newspapers the internet and social media have opened up many more avenues for communication and collaboration. I wonder if Mr Shearer was able to get any response to his plea. Today I can sit in my study and find immediate answers for David. In less than a minute I found Public Trees on Ancestry for Charles Michael Woodward. I found there also many references to Richard Gabell. On Trove and at the Australian War Memorial I found information on Richard and Elizabeth's son, also named Richard. I could have gone on and on finding more information for David but my other duties called. We are fortunate these days to have such easy access to online information. Having plenty of material for future blog posts makes life easy. About nine weeks ago when I had a bit of time on my hands I set up the Geneadictionary over on Wordpress. As I have been using blogger for eons this was a brave move for me. I didn't know if the Geneadictionary would be a flash in the pan or if I would be able to find enough content to maintain a regular posting schedule. Several of my genimates look out for and even coin words and phrases to add to the dictionary, I am so grateful to them for their assistance, as I add their suggestions I try to add their names to the list of Genealogophiles at the Geneadictionary. I seem to have developed a heightened awareness for Genealogisms which seem to jump out at me as I read genealogy news. I find myself waking up at night and grabbing my phone to add to Evernote a new word, phrase or acronym that has just hit me. Can you believe that I have 279 entries for inclusion in the Geneadictionary saved in my Evernote folder? I think the Geneadictionary is here to stay. GAGs is into its fourth week with a new selection of blog posts I have read and enjoyed for various reasons over the past week. I am so impressed by the quality of many of the posts from downunder I read each week, our geneablogging is going from strength to strength. As previously stated the selections here are subject to my personal biases and I make no apology for that. 1. I was going to share this image on my blog but Janelle beat me to it. 3. It's not nearly as good as being there but this recount from Shauna gave me a glimpse of an event that was held recently in Sunny Queensland. 4. And if you also read Tanya's post straight after Shauna's you will get a fuller picture of what went on at Angling for Ancestors. 5. I like the way that Nola has split up a long story into several posts of a manageable size (for someone like me with a short attention span). This post is one of a series. 6. Helen is also blogging on a theme. In this post she ties her content to a current event. 7. While I'm on the theme of series. Here is a Loveday blogger who is telling a family story in small chunks. 8. Let's not forget that small museums often have priceless local resources. 9. A Sensational Story for Sepia Saturday from Sharon. 10. I missed this news and perhaps you did too. Thanks to Fran from Manly Library. It is so hard to limit myself to ten selections although I am tempted to add more. ...reminds me of a Roald Dahl book Revolting Rhymes. As you know I often dive into a new adventure and then realise that I somehow need to keep track of what I am doing. I need to create some more records and, as organisation isn't my strong point, I call them revolting records. I have now put together my fourth list of GAGs - GeniAus Gems. I have a system in Evernote where I save posts for consideration for the next week's compilation but I haven't kept a record (except for my GAGs posts) of the bloggers and blogs I have actually included in one of my lists. I need to do this because I can't remember in my head which are the blogs and bloggers I have nominated and because this evening it struck me that such a list would be an additional evaluation tool for when (and if I am invited) I help Inside History Magazine select their Top 50 Blogs you need to read in 2015. That I stayed awake until 2:30 am the other night until I finished this book indicated that it must be a cracking yarn. The Lost Ancestor by Nathan Dylan Goodwin is available in both hardcopy and ebook format the book can be purchased from Amazon.co.uk. The Kindle edition can be purchased in Australia from the local Amazon. The fruit is soaking and although I have covered the bowl I can smell the rum wafting from my kitchen. Tomorrow I will be baking the first of my Christmas cakes for this year. I have a trusty recipe from a friend, I don't have my grandmother's because she didn't have one. She just put in a bit of this and a bit of that and her cakes always turned out. For those who ar contemplating baking a cake there is plenty of advice to be found on Trove. When I was last at Rootstech in 2013 I organised a casual dinner for my genimates from downunder and anyone else who wanted to join us. As well as Aussies we had US Kiwi Roger Moffat and Lisa, Australian Kiwi Michelle Patient, Audrey Collins from England and Marie Dougan from Scotland. My Aussie Genimates Alona Tester and Jenny Joyce have already indicated that they will be available on Tuesday 10 February, 2015 so I have set that as a date for a pre-Rootstech get together, for arrival no later than 7:00pm We shall return to The Californis Pizza Kitchen at The Gateway Center as it provides many menu options for an economical meal, is just a couple of stops from The Plaza, Radisson and other hotels on the free Trax tram and is not as crowded as the restuarants in the newer City Creek Center. I will warn CPK of our impending invasion. Please let me know if you can join us and I'll keep you in the loop. Mr GeniAus, my friends and family members have an inflated opinion of my expertise in genealogy matters and often refer questions to me that are outside my sphere of expertise (which is quite limited). I have been helping out an old friend from my church youth club days with basic help. She compiles a list of questions and contacts me every few months to share her finds and seek guidance. Among her questions this week she wanted to know where she could go to print out family tree charts. As she uses Legacy software I suggested she see what Tessa Keough has shared on Youtube to see if there are any answers there. Preparing a chart for printing at Officeworks or the like might be a challenge for Evelyn so I want to suggest other option. I also mentioned Janet Hovorka, The Chart Chick, in Utah who has loads of expertise in printing charts, I guess she would post to Australia.There was also a lady in Canberra who offered this service but, as meeting her was before my Evernote days, I don't have her contact details. I was flipping through Gould Genealogy's latest catalogue that arrived during the week and I found an advertisement for Professional Chart Printing from MyHistory in the UK that is linked to Gould Digital Printing in Australia. On this page of their website they give instructions for saving your chart so you can upload it for them to print. Have you any other suggestions for Evelyn? I travelled to Baulkham Hills Branch Library last Wednesday to present a talk on online resources for family history. I was rather nervous about doing this talk as a friend of fifty years standing announced a couple of days prior announced that she was coming along to hear me. Now talking to a room of strangers is daunting enough but speaking in front of someone who is close to me always sets the nerves going.But it was okay, my friend reckons that I didn't show any signs of nervousness. It was a small but enthusiastic audience who came along, all were eager to learn and most contributed during the lively session. Antonella, the librarian who looked after me was a great ambassador for hr library and I thank her for organising the event and for the morning tea provided. That was a nice surprise. "Just a brief note to say thanks for your talk at Baulkham Hills Library yesterday. It was superb. As a definite amateur , your talk filled in a lot of gaps for me. 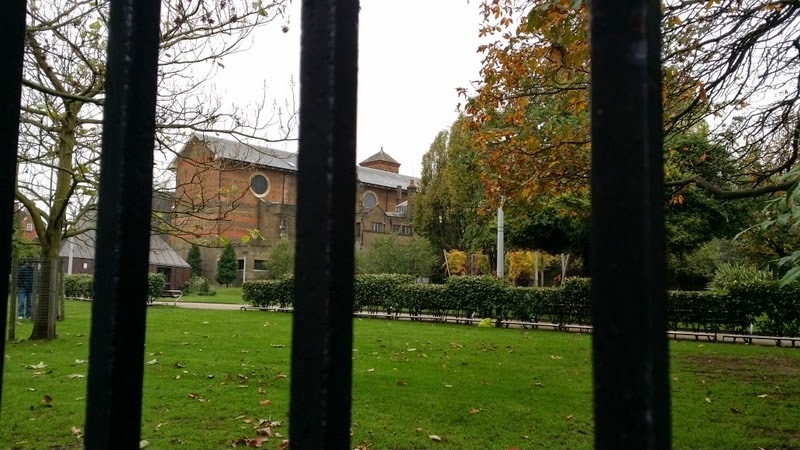 Some sites were old favourites but many were new ....and interesting! I love the stories that I find. The names and dates are good but it is the stories, choices and gossip that fascinate me. It is pleasing to know I hit the mark with at least one attendee. After the talk my schoolfriend and I adjourned to a local coffee shop for a bit of one on one tuition. She has been gatheirng family history dates and documents for many years and, now she is retired, has decided that it is time to get organised. On my suggestion she had downloaded Family Historian software and has been inputting data but she needed help with a couple of functions. I really enjoyed showing her how to import multimedia items into her database, how to add fields to and sort the columns in the record screen and how to set up named list. It was so much fun to sit and teach such an enthusiastic and smart learner. 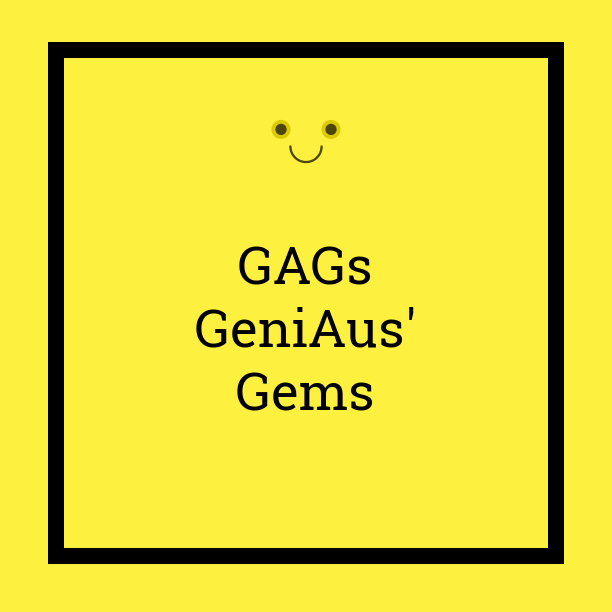 GAGs is into its third week with a new selection of blog posts I have read and enjoyed for various reasons over the past week. As previously stated the selections here are subject to my personal biases and I make no apology for that. 4. I'm a sucker for book related stories so I really enjoyed Anne Young's well illustrated post. 9. A few Australians commented on this post from Canadian blogger Lorine. What do you think of what she has to say? I will endeavour to notify those mentioned above when I have a spare moment. As my mother's father passed away just five weeks before my parents' planned wedding Mum and Dad opted for a quiet family celebration. 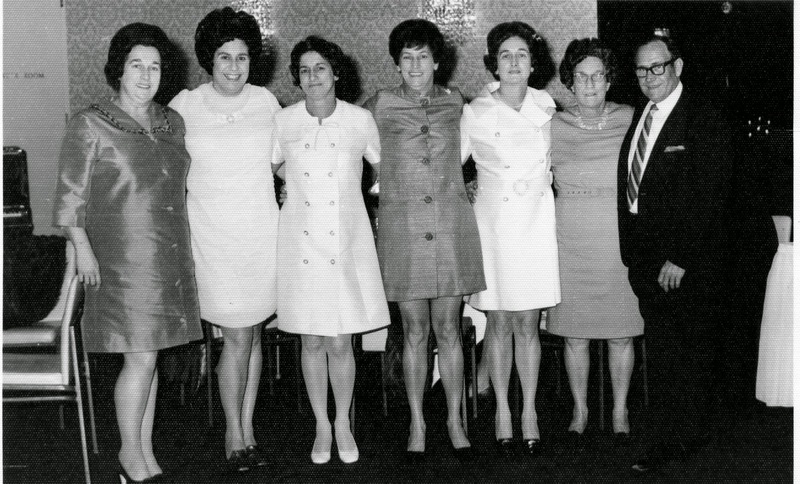 All of Mum's sisters manaaged to have fancy long white wedding gowns but Mum made do with a stylish dusty pink ensemble, I wonder if Mum ever regrets her choice of wedding attire. They had a quiet reception at my Grandmother's home in Kensington before setting off by train for a honeymoon in Jervis Bay. Mum and Dad were married 66 years ago today, 7th October 1948. Today I think about the 51 years they spent together and the loving environment in which they raised me. I've been quiet for a day or two! Since I bought my new 4TB hard drive I have spent a bit of time tidying up my files especially my "Sorting" folder. One of the files I found was for one of Mr Geniaus' relatives, Francis Jollie Gowans, who was an officer in the Royal Navy. When I was in England in June I paid a visit to The National Archives where I downloaded some digital files and ordered and copied some original records. This is the record I requested : ADM 340/281. Francis' folder contains over 40 pages of letters, reports and documents. There is a wealth of genealogical information in this file, it is going to take me an hour or two to extract all of the information and enter it into my database. As Francis isn't a direct ancestor this is not high on my priority list. I have, however cliped a couple of snippets from the file to share here on this blog. Come and see the real thing, come and see the real thing, come and see"
Access to online resources is convenient and easy but there's nothing like the Real Thing. Before travelling overseas earlier this year I realised that I needed a portable hard drive with more than 2TB of storage. I thought that if there was one place on earth I could find such a beast it would be Bangkok. Dragging Mr GeniAus along I went to the big technology mall, Pantip Plaza, in Bangkok in search of a portable drive of 3 or 4TB but there was none to be found. One stallholder said he could order me one in but that it would cost more than $AU1,000, my response was "Thanks but no thanks". As I had an overseas trip in the offing (and in Australia we can apply for a 10% tax rebate on goods purchased in the four weeks before we travel) I exercised restraint and didn't make a purchase on impulse. I retreated home, read some reviews and discovered that the device was over $AU100 cheaper at B&H in New York where I like to shop. As I needed wanted the drive before I travelled I realised that I would have to pay a premium (as we nearly always do in Australia). As it is now less than four weeks until I take off on my next adventure I went to the shops on Friday and bought my new toy. I burnt the midnight oil as I put all of my data, docs and photos onto the drive and then asked Picasa to index the photos and left the computer humming overnight. Now all is organised once more, it is so nice to have everything in one place once more. I'll have lots of space to store the happy snaps I take on holiday. 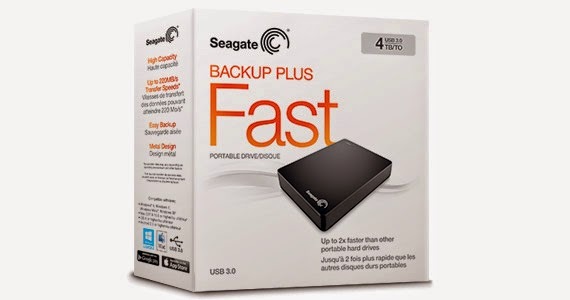 I wonder how long it will be before portable 8TB drives are on the market, I guess 1 Petabyte drives are just around the corner too. Kathleen Jane Duncan would have been 88 today. I don't know why Aunty Kath was born in Nyngan, NSW when at the time of her birth the family lived in Cobar, NSW. I must ask my Mum if she remembers the story behind this. 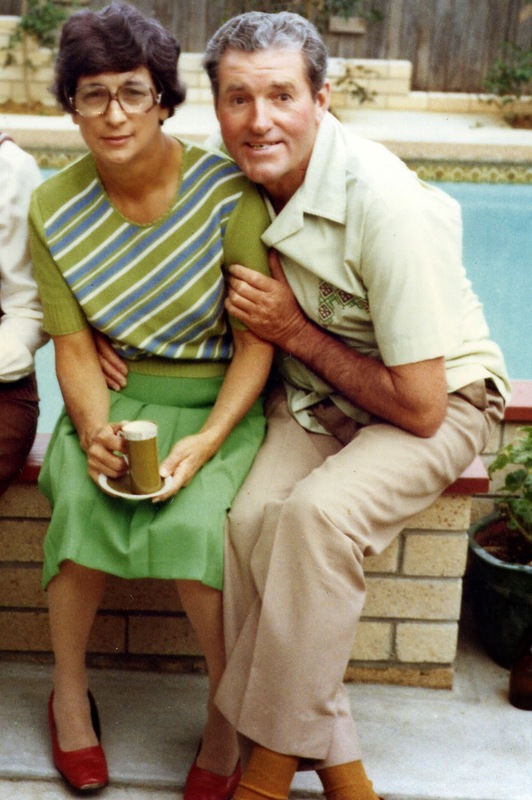 Kath married Englishman, Jack Madden, at Kensington, NSW in 1948. 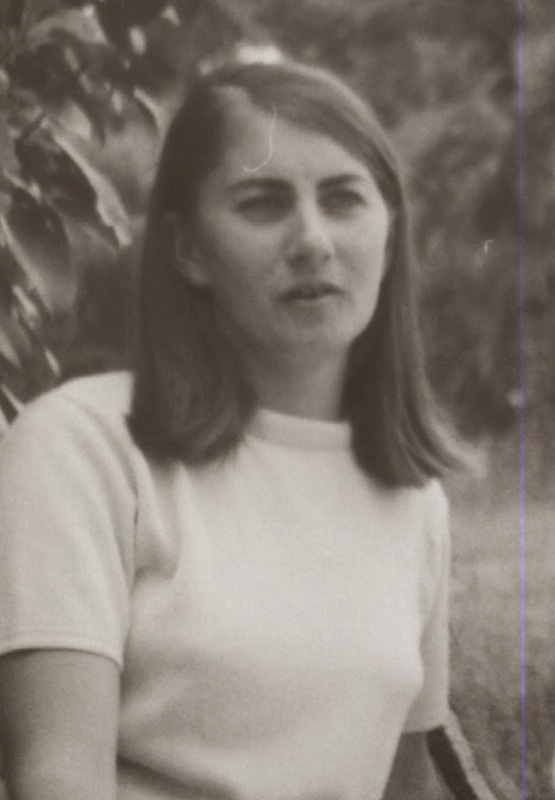 My grandmother (who wasn't biased) thought Aunty Kath was the prettiest bride in the family. A devoted wife, mother, grandmother and sister Aunty Kath was a pretty good Aunt. 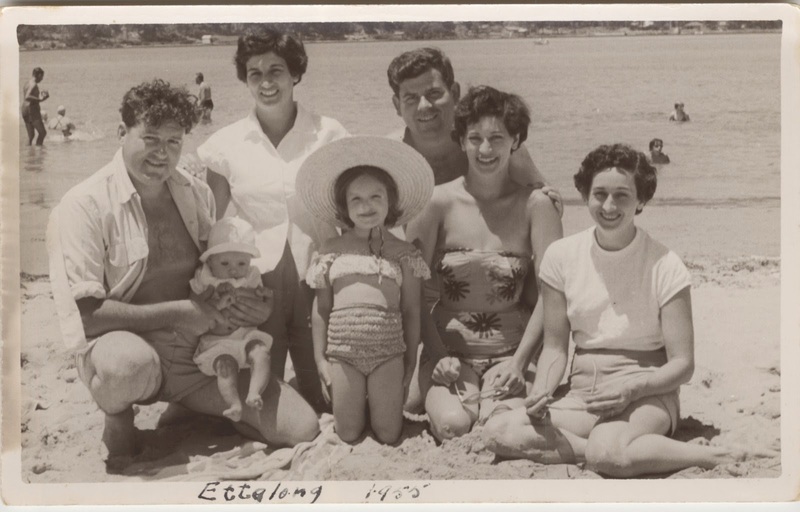 When my mother was working, Aunty Kath always had me over for a "Holiday" in the school holidays and she and Uncle Jack sometimes included me in their family's summer holidays to the beach. When it was discovered that I had a case of nits as a nine year old on holiday with the Maddens I was absolutely distraught. Instead of keeping me at arm's length Aunty Kath got into my little bed and comforted me. I'll never forget that kindness. When I was a little girl Mum and Kath ran a smallgoods shop and delicatessen in Kensington, NSW. Aunty Kath and Uncle Jack lived in the residence above the shop while Mum, Dad and I stayed there on the weekends when it was Mum's turn to work on Saturdays. As an only child I enjoyed that time spent with the extended family and the easy access to the chocolate malted milkshakes served in the shop. Aunty Kath encouraged me in my reading by lending me some of the books she received from her book club. 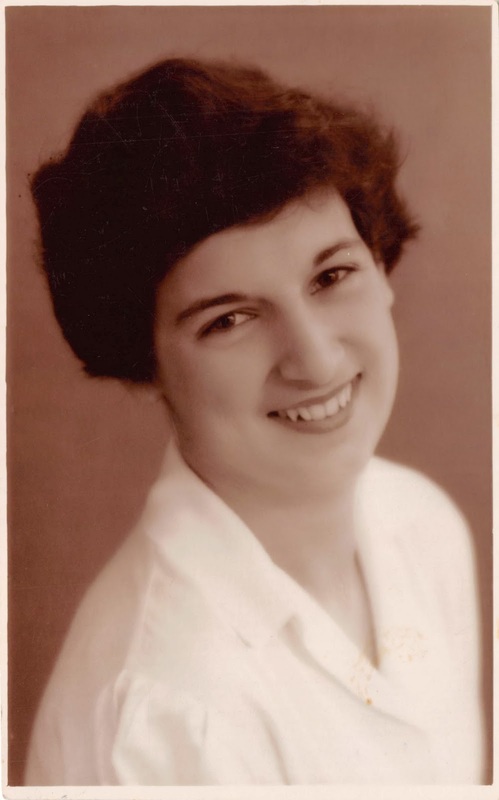 it was exciting as a 12 or 13-year-old to be introduced to works for adults, I still remember reading her Monica Dickens books, those by Betty MacDonald and some titles about life in a prisoner of war camp in World War II. Kath was the only one of the five Duncan girls to get a driver's licence, I remember how I loved going out with her and my cousin in her little black Mini. Kath was a hard worker, together with her husband Jack Madden she ran a very successful hotel supplies business in Sydney. (see my post on the green plates). They retired a couple of times but soon found themselves back in business. 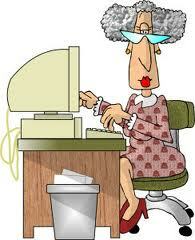 After Uncle Jack's death Aunty Kath went to work for their accountant, she was a whizz with figures. Although she was in her mid seventies her co-workers all thought she was in her early sixties, Aunty Kath was as sharp as a tack. My mum and Aunty Kath had a very close relationship, every Saturday for many years Kath would pick Mum up in her car and they would head off to shop and visit their mother, Ethel, and sister, Eileen. Included in these excursions would be some clothes shopping. The Duncan girls loved to chase down a bargain. My Aunty Kath was very special to me. I know I've posted previously on netiquette but I can't seem to find that post (I need better tags!) anyway it's about time for another rant to share some more thoughts. I hadn't planned this spontaneous post, it was something I just had to get off my chest and a resource I found gave me a shove. Recently two newish Tweeps representing genealogy organisations I am familiar with have starting tweeting in earnest. I have been concerned that these newbies are not using Twitter effectively to promote their brands or messages. It appears that they log onto Twitter at a particular time, send out a barrage of tweets and then go away for a few days. What is also unfortunate is that they also retweet indiscriminately posting items that are not particularly relevant to their organisations' missions or aims. Retweeting alone is not satisfactory they must also post original material. While it is fantastic to see people embracing social media there is a danger that if they donn't think about why, when and what they are tweeting their presence will be ineffective or even annoying. As I was reading through my RSS feeds this morning I found this very useful infographic originally posted at http://www.tollfreeforwarding.com/blog/social-media-etiquette-guide/ and shared today by Stephen Abram. Although it is directed at business the tips are also pertinent to organisations and individuals. The very first point for Facebook "It's okay to update several times a day but space out your posts every few hours" is relevant to Twitter and the new tweeps I mentioned above. Last week's inital collection of GAGs received some enthusiastic responses - certainly enough for me to continue with this trial. As I have read through my RSS feeds this week I have saved links to several blog posts into my Evernote Genealogy Notebook with the GAGs tag. I didn't know how many I had until I started to write this post. Thankfully I had not gone crazy so I didn't have to delete too many selections. 1. A bit of history with some beaut coloufrul photos from Diane brought back some childhood memories. 4. Alex's event report gave me some beaut leads. 9. I was going to be selfish and keep the links to these fun apps to myself but I thought better of it. 10. Thanks to John in Canada for showing me how I can easily part with some GBPs. I will notify those mentioned above when I have a spare moment. I already know that I cannot post comments on one of the blogs mentioned above.